The grand reveal of the twelveby12 Dandelion quilts has begun. Blogger is refusing to let me post photos now but I revealed earlier and so you can see mine with the acompanying tale at http://twelveby12.blogspot.com/2007/10/where-does-all-yellow-go.html . Don't forget to check out all the other quilts. I rang back. Had to go through the automated process again. Twice. But once was my fault becuase I tried to buck the system by inserting number commands too quickly and ended up with French instructions. Spoke to a human who told me there was a technical issue. I KNOW!!!. She began to take endless details including my phone number and said they would ring back in the next two days. She got as far as half of the product key when the line went dead. Did she ring back for the rest of it? Did she ******. Adobe Photoshop Elements refused my serial number three times but took it on the fourth attempt. Adobe Flash player will not install at all. EQ 5 reloaded no problem at all (and thank you Rio Designs for including a note of the serial number on the invoice for easy access). I am about to reload the camera programme and I have lost the disc for the printer driver so will have to download on line- keep fingers crossed! Finally thanks to Dennis who has just shouted to say that he has cooked for me!! En route to Man United's football ground to lecture for an hour, I took it to a computer shop. They didn't know what a hive file was either but offered to let me book the laptop in a week on Tuesday. I did no more than look at the technician and he offered to print some instructions off to enable me to self-remedy what he diagnosed as a Windows problem. ('It just happens sometimes'). The version which might possibly have saved my data didn't work and so the laptop is now up and running but I have been sent back to the factory settings. Not eveything was backed up so all the photos I downloaded last night have gone as has other bits and bobs. Most annoying though is the lack of programmes. Adobe Acobat downloaded fine. Norton Security webiste told me I had to uninstall my non-existant programme before I could reload it. However, they have a nifty little chat facility where someone tells you what to do. He gave me a link to get my 2007 version that I have paid for., Rather suspciously I seem to have a 2004 version with a free option for 90 days upgrade to more recent virus protection. Why 90 days when I have already paid for a years subscription in 2007? I think I will fight that battle another day. Then to reload the Micrsoft Office works suite. In goes the infomatoin for Internet registration. Won't do it. I expected that because I have been through this before and because the product key has been used already they need to speak to you to check that you are not inappropriatley using a friend's disc. So I go to the telephone option as instructed. The toll free number doens't work. It has too many digits so I suspect is a US number. The other option works and defaults me to an automated service. It requires me to enter the 16 digits of the ID number on the installation wizzard. There are only 12. I sit there yelling "Help." "Assistance?" "Customer Service!" until eventually the machine lets me have a person. The person is a polite Indian man who is now very puzzled because I should have 16 digits. In fact I have an numerical ID deficit. ( This may explain a lot in life!) I have to ring back in half an hour when he has spoken to the technicians. I have a shedful of work I cannot do without a copy of Word. I am not a happy bunny!! I will update you. Continung the conversation from last night, I have just told Dennis that the first five visitors to the Cottonpatch shop each day get a free gift of a magnet and pointed out that as it only opens at 10am we have a real chance of actually being the first visitors without making a special effort to do that. "Really?" He said. "Each vistor gets one?" Now I am good at reading his mind ( usually), so I surmised that what he was really saying was, " Well if its one per visitor, lets go in separately and get one each and even though it is bound to be a quilty magnet that I don't want, you can have it because you love quilty things." See, that's just the kind of guy he is. So I replied, "Yes. One each. Its good isn't it. Even though we don't have a metallic door on our fridge to actually put a magnet on...."
He frowned, thought, and then his shoulders sagged. "Oh. " he said. 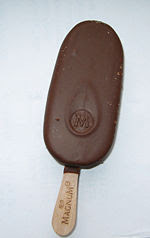 "I thought you said a Magnum *." Don't worry folks. I will ensure he gets one anyway as a detour reward! The long running debate between me and myself as to whether to drive or train it to Birmingham today is, last night, easily solved when I realise I was simply too dog tired to drive for five hours on a motorway in one day. I give up watching an extremely boring episode of Michael Palin's tour of Eastern Europe and go to log onto Qjump . I find a way of doing the journey on trains that provide a first class carriage with minimal changes, so the snob in me is happy. Right. Lap top off, into the bath then to bed. Decision made. Except.... it was still calling me. Those two walls of potential- Christmas- present -quilting-books just as you walk in the door, the low rack under the window full of neat Japanese and country style Australain magazines. Two whole rooms of fabric to touch. Come to me, it sang like the sirens that used to lure sailors onto the rocks. Come to me with my beautiful alluring products. I get out of the bath, shrug on a dressing gown and go and interupt Dennis who is watching some obscure footie match on Interactive Freeview TV. " You know how the quilt shop is kind of in the middle of the bottom of Birmingham?" (It doesn't do to be too precise with my lovely, but directionally challenged husband) "And you know how it is so tempting because I am going to the bottom right tomorrow anyway? And you know how we are getting up early to go to Bath on Saturday for the week and that the M5 motorway kind of goes not that far from the bottom left of Birmingham...."
He mutes the TV. "How long a diversion?" "Only half an hour. Each way. And say an hour in the shop. Max." I am saved. I turn to stumble off to bed when he says, "Hang on I want to show you this bit of Michael Palin I recorded." Readers, I confess to being ungrateful. I confess to being unwilling to swap my two hour diversion from his holiday time for just a minute or two from my time. I am cranky, I am tired, and Palin was boring. I think of Japanese magazines. "Go on then." He shows me an aerial shot of Palin climbing up stairs onto the upper floor of a Soviet era satelite spy installation. It is dull ( both in colour and content). Dennis pauses it just as Palin's feet get to a smudgy landing. "There. Look!" He points at some green and brown tiles. "Its just like your quilt." He rewinds it. Plays it again. "Only yours is a better pattern." Yesterday I decided to start to reduce my scrap stash by cutting lots of 4 inch squares for a scrap quilt - an easy, take-along wherever I go hand sewing project I thought. I spent all afternoon cutting and achieved 150 or so squares. This did not seem to reduce the scraps in the slightest ( perhaps because I stuck to the 'rule' of no more than 2 squares from each fabric.) The pattern calls for 960 squares. Five minutes after I sent that I found on my - reasonably tidy at the moment- desk, AA routefinder directions from the NEC to the shop printed out on 10th October last year - presumably when I did the conference and side trip then. I have no idea how they got onto my desk but Lesley took it as a sign that I had to go - the quilting angel is, so she says, on my shoulder. Only just now the post arrived and in it... the mail order catalogue for the very same shop. Another sign that I should go and buy charm packs or a sign that I could just mail order them. I am confused. At least I now have good reading as an alternative to the two lever arch files of legal papers I have to read on the train to London I am catching at 3.30! On Thursday I set off at 6.15pm to drive to my parent's house, an easy hour and a half straight up motorways. I had picked up a last minute brief for Carlisle County Court at 10 am the next morning and was taking advantage to stop off in Penrith en route and to deliver some stuff Mum wanted for our collaborative quilt. Just south of Lancaster, I was in the middle lane at 60 pmh, in the dark and rain, overtaking a lorry. There were several cars in front of me. Just as I drove into that momentary blind spot when you get the sudden heavy blast of spray from the lorry, I realised that a car had sped up the fast lane to my right at at least 90 pmh and was about to hit a car, which has pulled out of my lane. I saw him slam on his brakes, then I got that blast of spray and could only just make out his lights seemingly going sideways and realised that there was going to be a pile up. In fact he must have managed to swerve - or skid?- through the gaps and end up on the hardshoulder and there was no collision at all. Even so it was a shock. A mile or so later I then had to drive through a set of roadworks with cones with the lorry still close to me. I don't particularly like that, as you will remember my car got smashed up last year due to a lorry clipping the cone on a motorway and causing me to swerve then skid. I was a little nervey so I decided to pull off at the next services and take a breather. I parked, turned the engine off, burst into tears and realised I was afraid to get back on the motorway in the dark. I felt really silly - I am such a confident driver, but I was really scared. So, at the ripe old age of 37, I rang my long suffering parents to come and get me! Mum prescribed a hot drink and a Mars Bar for shock while I waited - only I could hardly walk to the cafe becuase my legs were shaking. I was only 1 mile from a junction so after some sugar I made it to a pub off the motorway and they drove 50 mins or so to meet me. I agreed that I needed to drive again very soon so Dad sat with me and Mum drove in front of me so I would have some slow brakelights ahead of me over the rather high isolated partof the journey known as Shap where the weather often gets quite bad. So off we set and Mum misses the turning for the M6 North. I, gripping the steering wheel tightly, just follow her like we still have the umblicial cord thing going on and we have then no alternative but to go South to Preston. This is a detour of some 35 miles which requires me to drive not just past the scene of the accident that didn't even happen but also through the roadworks again - twice!!! We get to Shap and there is fog. I am muttering "Oh,oh oh, Fog. I can't see. I don't like this" and all I get in repsonse is, "Fog? Your generation has never seen real fog. This is just a bit of mist. In my day we had real peasoupers...."
At least the aversion therapy worked and when I saw the lights of Penrith I left Mum behind and did the last bit all by myself ( big, brave girl.) and we finally got there at 10.30pm! I did another half hour in the morning up to Carlisle without batting an eyelid - at least until I got there and found that in fact the case was listed at 2pm and I could have come up on the day in daylight after all! Oh and the other reason I feel an idiot is that I have, finally, almost cut out all the pieces for a quilt kit I was given for Christmas last year. Only almost, because I turned my ruler around and cut three strips at 4.5 inches not 5 and now I am 30 cm short of fabric and have to find some more. The most likey opportunity is when I am working next week near the shop that sold the kit , which is located - guess where - yup. South on the M6 motorway. Ever tried to convince your partner that every quilter has a stash the size of yours - in fact probably even bigger - and that you are not sufereing from some compulsive disorder that requires urgent inpatient treatment? If so go to this link, which I stumbled on today to see photos of people's stashes. Now, all those people, they can't all be ill can they? So what say we all have a go and make a little quilt for this charity? If you do join in leave a comment here with a post to your blog where you show your quilt in the future so we can track them all. I am a proponent of spray basting for quilts. Pin backing to carpet, shwoosh of spray, pat down wadding, shwoosh of spray, pat down top. How easy is that?! I do pin the very edges just because I am careful not to spray the carpet with basting spray too, but that only takes 5 mins. 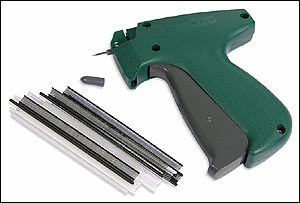 As such I have never used the Micro Stitch product which is a gun that send plastic tacks through your quilt. However, just now as I scrabbled around to find two matching trainer socks to take to the gym I suddenly thought - is this not the ideal laundry product? Keep the gun by the laundry bin. Tag your socks as to take them off and untag them after they are washed and just before you put them on. No more lone socks. I would be classed as a genuis for my fantastic ideas, were it not that it was only during the typing of the last paragaph that I remembered - I am going to the gym today for aqua aerobics..... but on another day I will need socks.....!! Today I finished my first quilt for the Twelveby12 group challenge. I can't show it to you becuase we are having a grand reveal on the blog on 1st Nov - be sure to check us out! However, I will say that it has got me all philosphical. This is the first quilt I have made which is about something as opposed to just looking pretty. I wouldn't say it tells a story exactly but it does represent a thought - a kind of life musing- triggered by the process of thinking about dandelions which was the set theme. My question is - does it matter if no one else can get to the same thought just by looking at my quilt? Or indeed, does it matter if they come to another interpretation all together? Personally, I am more concerned that the embellishments don't fall off than I am about imparting some great nuggets of wisdom. But I'd like your views on whether clarity of message is a part of making an art quilt 'successful' . As regular readers will well know, I am on a concerted effort to finish up some works in progress. I pulled a wallhanging, which I had made in a group session at Douglas Valley Quilters, out of my cupboard yesterday and stuck it up on the design wall, partly to give me somthing nice to look at and partly so I could consider how to quilt it. At just 23 x 24 inches it would be a nice quick done-in-an-evening job. I left the room. I re-entered the room. I thought, "You know, that wallhanging would actually make a fantastic center for a bed sized quilt." (b)I never get to the end of my WiP list and (c) my mug of green tea ended up all over the carpet - I set it down on the floor (I never learn!) and completely covered it with green fabric... one tug of the fabric to see how it looked next to the brown and.. splish splash!! My husband has seen all 42 matches in the Rugby World cup so far ( and a few Welsh league and local club matches in the same period!). Me? Mostly I have taken advantage of undisturbed time with my machine. But today, at the quarter-final stage, was when it started to get interesting as far as I was concerned and I did manage the last fifteen minutes of the two matches. I am aware, given I have some many faithful readers from down under that I should be magnaminous but, heck, you wouldn't be in my shoes would you?! I think I will save needleturning those Japanese flowers for the semis next weekend!! In my blogging absense I have been holed up in the Novotel in Leeds, teaching law by day and making log cabins for a commission quilt by evening. I took a photo of the little sewing area I constructed - machine on the dressing table, TV to the right with an ironing board acting as a return table below it and a chair holding my plastic box of strips to the left. I took my own extension bale and ott-light... I am sure the maid wondered what I was up to! Sadly I am too inept to work out how to download the photo from my phone. ...the request being for a variation of my Leaf Peeper quilt, which my client bought from Quilts UK And these are the blocks so far. Obviously the 'odd flower out' in the cream blocks is not staying in its current position but will go at the corners of the outer line of log cabins with its mates not yet made. The colours are so different from those I would normally choose - very muted and no brown in sight. But, as I had to buy so much fabric to get the variety of strips, there will be lots left over so I guess I will have a chance to see if I can do something less tradtional with them!